A forensic anthropologist works to exhume the body of a peasant killed by the Guatemalan Army in 1982 during the civil war. Chucalibal, Quiche, 130 km west of Guatemala City. The Guatemalan Foundation for Forensic Anthropology oversaw the exhumation, which was visited by family members of victims of violence from around the world, including relatives of victims of the September 11 attacks in the US. May 17, 2005. 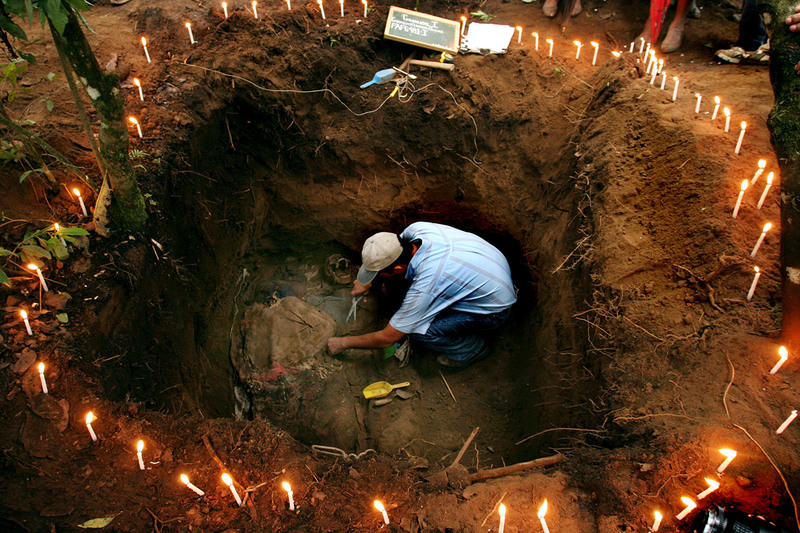 • In this image, we are witnessing the exhumation of a grave—one of the first steps in the reburial process. What details of color and composition in this photograph stand out to you? • Photographer Rodrigo Abd notes that “there is still a void to be filled in terms of how these communities were affected by violence and what effect the exhumations [have] had on the daily life of the villagers.” How do you think such a process would affect daily life throughout the nation? How might the resulting challenges be addressed? • Why do you think the photographer explains that the exhumations were “visited by family members of victims of violence from around the world, including relatives of victims of the September 11 attacks in the United States”? Why might those visits have mattered? What impact might those visits have had? On whom? • By looking at the photographs, have we become witnesses to the exhumation? If so, what responsibilities, if any, come with that witnessing?